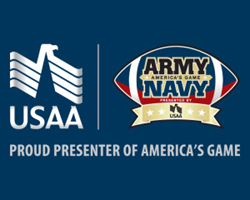 USAA, the presenting sponsor, has joined forces with MilitaryOneClick to give away a VIP ticket package to this year’s sold out Army-Navy game Dec. 13 at M&T Bank Stadium in Baltimore, Md. Army-Navy Game 2014 - Win VIP Tickets! “We are so excited to be working with our sponsor USAA again this year on giving away tickets to fans who would not normally be able to sit so close to the action,” said Jennifer Pilcher, Navy spouse and MilitaryOneClick.com founder. USAA, the presenting sponsor, has joined forces with MilitaryOneClick to give away a VIP ticket package to this year’s sold out Army-Navy game Dec. 13 at M&T Bank Stadium in Baltimore, Md. The in-demand package includes two game tickets, pregame field passes and a commemorative game coin. For the second year in a row, MilitaryOneClick and USAA have teamed up to provide an exclusive fan experience. “We are so excited to be working with our sponsor USAA again this year on giving away tickets to fans who would not normally be able to sit so close to the action,” said Jennifer Pilcher, Navy spouse and MilitaryOneClick.com founder. The entry period closes at the end of the day Dec. 11 so that winners can be notified Dec. 12 via email. Entry is simple. While the teams don’t take to the field until Saturday, the Army-Navy rivalry is already raging in the December 2014 MilitaryOneClick Charity Challenge between Army Emergency Relief and Navy Marine Corps Relief Society. Both charities aim to support service member families in financial need. Those hoping to earn the coveted package can visit the game day page and choose who they want to win the themed charity challenge. MilitaryOneClick has been awarding a donation each month to a military-related 501-3(c) for the past two years. “We love giving back to our community who have given so much. This is an easy and fun way to get the community involved and this year’s Army versus Navy Charity Challenge Battle has been incredible. The results are changing hourly,” Pilcher said. The challenge winner will be chosen Saturday and the donation will be provided to either the Army or Navy organization. The Army-Navy page on MilitaryOneClick is filled with a virtual tailgate-style party. They have the giveaway, Spirit Spots, live Twitter streams for the game, tailgate food ideas and more. For more information about the giveaway contact Pilcher at Jennifer@militaryoneclick.com. MilitaryOneClick (http://www.militaryoneclick.com), founded and led by Jennifer Pilcher, one of the nation’s foremost experts on military Families, is a premier online resource for active duty military, reservists, veterans and their Families. A military marketing consultant and military spouse herself, Pilcher and MilitaryOneClick work with clients that include Amazon, MetLife, GM, La Quinta Inns & Suites, Sittercity, USAA, U.S. Chamber of Commerce and more. MilitaryOneClick connects directly with their community daily through militaryoneclick.com, social media, blogs, e-newsletter and boots on the ground events reaching more than 1.6 million people a month. AER is the Army’s own emergency financial assistance organization and is dedicated to “Helping the Army Take Care of Its Own.” AER provides commanders a valuable asset in accomplishing their basic command responsibility for the morale and welfare of Soldiers. AER funds are made available to commanders to provide emergency financial assistance to Soldiers — active and retired — and their dependents when there is a valid need. Navy Marine Corps Relief Society provides financial assistance and education, as well as other programs and services, to members of the United States Navy and Marine Corps, their eligible Family members, widows and survivors. The Society also receives and manages donated funds to administer these programs and services. The Society’s main goal is to help each person who asks for support for his or her immediate needs. The long-term mission is to help Sailors and Marines become financially self-sufficient by learning how to better manage their personal finances and prepare for unplanned expenses.